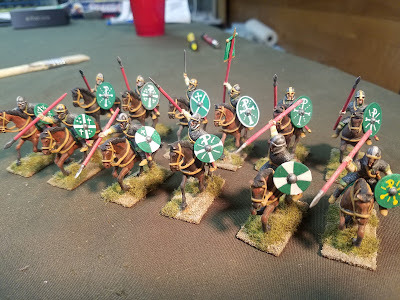 I finally finished the Gripping Beast Late Roman Heavy cavalry that I reviewed a couple of months ago. They told me that retirement would "give me more time" for myself, liars! Lovely painted ! And since I am experienced at being retired (seven years ago already) let me warn all that "retired" means not having a paying job anymore. Do not make the mistake that you will not necessarily work anymore ;-))))). Thanks for the warning Porthos, I might just go back to work! Having retired almost two years ago now, I have been wondering how I ever managed to fit work into my busy life. Then I realized that work had just been keeping me from doing all of the things I wanted to do. Now I just enjoy life instead.